It is hard to imagine such an impulsive and physically active man of the outdoors could sit quietly at his desk and patiently learn to be a great writer. But Theodore Roosevelt did just that. A “strenuous life” describes not only how he lived, it also is the title of one of the 35-odd books he wrote. Roosevelt was such a diligent and skilled writer, that when he lost his fortune in the Dakota Territory after the brutal winter of 1886 and had to find a way to make a living and support his family, he did so for the rest of his life by writing. Relatively modest salaries from public and elected positions never were his main source of income. Roosevelt also wrote scads of letters, by one estimate more than 150,000. Collections of letters to his children are so warm and tender, so fatherly and instructive, and so well-written, they were published as a collection, Theodore Roosevelt’s Letters to his Children. His style could be strong, introspective, exuberant, angry—whatever the occasion called for. 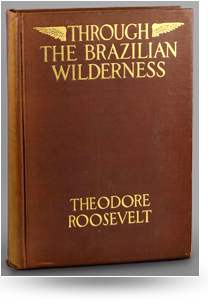 Theodore Roosevelt was more than a great president and iconic American, he was and still is a pleasure to read.